Back from the break and Reigns vs. Miz is confirmed. Dean Ambrose and Seth Rollins wait in the ring as RAW Tag Team Champions The Bar are out for singles action. Sheamus and Ambrose go back & forth to start. Ambrose catches Sheamus off the ropes and takes him down by the arm. Sheamus fights up and out, beating on Ambrose against the ropes. Sheamus ends up keeping control and sending Ambrose to the floor as we go to commercial. Back from the break and Ambrose looks to make a comeback but Sheamus powerbombs him for a 2 count. Sheamus keeps Ambrose grounded now and focuses on the elbow. Sheamus continues to dominate Ambrose as some fans chant “you look stupid” at him. Sheamus poses and talks some trash. Sheamus grabs Ambrose by his face and goes for a suplex but it’s countered. Ambrose decks Sheamus with an open-hand strike. Ambrose looks to make a comeback again now. Ambrose decks Sheamus and sends him into the ring post. 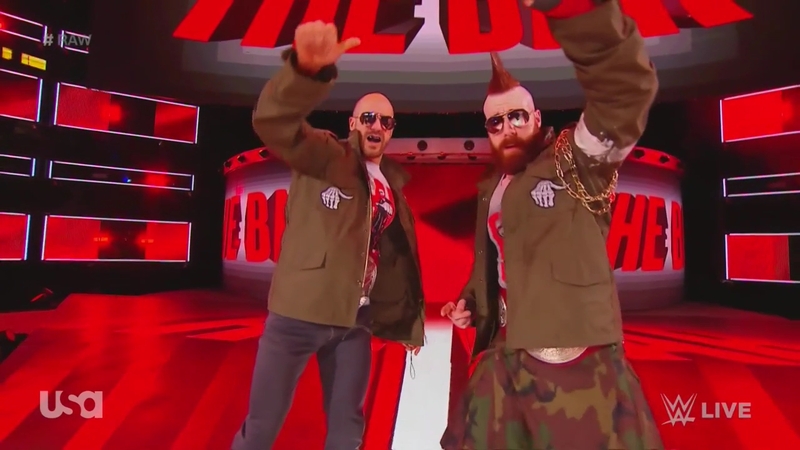 Cesaro comes over to check on Sheamus. Rollins cheers Ambrose on. Sheamus counters Dirty Deeds but Ambrose unloads with strikes. Ambrose with a knee to the gut and a pair of clotheslines. More back and forth now. Ambrose dodges a Brogue Kick, sending Sheamus to the floor. Ambrose runs the ropes and nails a suicide dive on Sheamus. Cesaro ends up attacking Rollins from behind, allowing Sheamus to roll up a distracted Ambrose for a 2 count. More back and forth between the two now. Sheamus ends up hitting a super rolling senton for a close 2 count. Cesaro can’t believe it. The finish sees Rollins take down Cesaro on the floor and unload on him. Ambrose takes advantage and hits Dirty Deeds on Sheamus for the pin. – After the match, Rollins checks on Ambrose as we go to replays. Back from the break and out comes WWE Intercontinental Champion The Miz for tonight’s main event. Roman Reigns is out next. We get formal ring introductions from JoJo. The bell rings and Miz goes right to the floor to stall. Reigns ends up chasing Miz back into the ring and Miz tries for a cheap shot but Reigns floors him with a big right hand. Miz drops Reigns over the top and comes back in but has a Skull Crushing Finale blocked. Reigns with another big block before a sitdown powerbomb. Miz kicks out at 2. Miz rolls back to the floor for a breather as we return to commercial. Back from the break and both go down after Reigns drops Miz with a suplex. They both get up and Reigns hits clotheslines. Reigns with another big clothesline. Reigns unloads with big shots in the corner as fans count along. Reigns runs the ropes and nails a boot to the face. Reigns readies for a spear but Miz gets up and retreats to the floor. Miz kicks Reigns on the floor and drops him with a DDT. Miz returns to the ring as the referee counts Reigns out. Reigns makes it back in just in time. Miz drops Reigns for a close 2 count. Miz keeps Reigns grounded with a chinlock now. Reigns fights up and out of the hold. Miz catches Reigns and hits the backbreaker neckbreaker combo for another close 2 count. Miz argues with the referee. Miz with a running shot against the ropes now. Reigns looks to make a comeback now. Miz moves out of the corner and Reigns misses. Miz with a pair of corner dropkicks now. Miz charges a third time but Reigns lifts him for a Samoan Drop. Miz blocks it and rolls Reigns up for a 2 count. Miz runs into a boot. More back and forth between the two. Miz charges in the corner but Reigns moves again. Miz ends up on the mat. Reigns regroups a bit. Miz keeps control and drops Reigns with another knee to the gut. Miz with the “yes!” kicks now. Reigns catches a kick and hits a Samoan Drop for a close 2 count. Reigns gets hyped up now as he waits for Miz. Miz blocks a Superman Punch but Reigns blocks the Skull Crushing Finale. Miz drops Reigns again with a knee and covers for a close 2 count. Reigns clutched his knee coming off the move. Miz stomps on Reigns now. Miz with the boot to the throat as the referee warns him. Miz with a big running clothesline in the corner. Miz goes to the top but Reigns nails a Superman Punch to knock him out of mid-air. Reigns with a close 2 count. Reigns gets hyped up again as he waits for Miz. Sheamus and Cesaro run down but Reigns swings at them, missing on the apron. Miz comes from behind and nails the Skull Crushing Finale but Reigns kicks out right before the 3 count. Seth Rollins and Dean Ambrose run down now to take out The Bar at ringside. Miz and Reigns are both slow to get up. Miz turns around to a spear from Reigns. Reigns covers for the pin and the title.